Have you noticed that our nation is chock full of armchair military strategists? Everyone seems to have an opinion about the war: At the highest level of generalization are statements such as -- “Our current policies have been a disaster” -- to which I reply with equal perspicacity and nuance: Says who? It’s hard to find a coherent strategy from any national Democrat (excepting Joe Lieberman) but they have in common a commitment to discrediting the war and accepting defeat. The House passed legislation last week, with 95 percent of Democrats voting in favor, requiring that the United States withdraw most combat troops from Iraq by April 1, 2008. The jist of their argument is that we need to step out of the way of the sectarian strife and let the Sunnis and Shiites battle it out. Little thought is given to the slaughter that would ensue; even less to the effect this action might have on U.S. security and prosperity, never mind the rest of the world. Armchair strategists have even suggested that allowing Iran to support the Shias would be a way to insure victory over the Sunni militias and their al Qaeda friends. Now there are reports (with videos) of a field in Iraq containing 50 Iranian-made rocket launchers, all aimed at a US army base. But hey, we ought to trust the Iranians, just like Jimmy Carter did. To attempt a rational conversation about the war it is important to have a realistic perspective of our goals and objectives. After 9/11 it was obvious that our decades-long strategy of siding with brutal dictators in the Middle East, while ignoring an occasional attack on American interests, was both absurd and immoral. President Bush took aim at two of the bad actors in the Islamic world when we invaded Afghanistan and Iraq. The goals were to overthrow the dangerous Taliban and Saddam Hussein regimes and to establish governments that would cease to be breeders and sponsors of terrorism. It was clear that dictators and elements of Islamic religious law that stand in the way of personal freedom and religious tolerance breed discontent. Thus the governments we are attempting to establish are based on core democratic principles including free elections and basic individual rights. Remember, terrorism is the third attack on Western civilization by radical Islam. To deal with terrorism, units of our armed forces are in 30+ countries around the world hunting down terrorist groups and dealing with them. This gets very little publicity. People can argue about whether the war in Iraq is right or wrong, but they should be clear about our strategy -- to remove the radicals from power and give the moderates a chance. We are demonstrating to the Islamic world that (1) America will not tolerate attacks on our people or interests and (2) freedom is the way to personal prosperity and happiness and acceptance into the league of respected nations. Our hope is that, over time, the moderates will find a way to bring Islam forward into the 21st century. It will take time and we must continue our effort. We cannot just pull out and let chaos take our place. And please don’t fall into the trap of believing that if only we weren’t in the Middle East peace would prevail. In the age of globalization the Western way of life is all too apparent to the peoples of the Islamic world. The masses love our freedom and prosperity but it is messing with their social constructs by empowering women, tolerating gays, respecting other religions. The radicals among in Islam, many educated men, find this social change intolerable and are willing to fight to destroy modernization, and us with it. I stand for peace, honor, truth and justice. I stand for freedom. I am confident. I am proud. Listen to Elvis sing “America the Beautiful” while you read this post. On the way to the Palos Verdes Estates “Old fashioned Fourth of July” party, I stopped at Starbucks for my daily latte (grande, no foam, single-shot). Good friend Rori Roje said “Oh, you’re going to see Mayberry RFD meets The Rich and the Famous.” Rori was half right. The PVE event was celebrating its forty-sixth year and it looked and felt like small town, mid-America transplanted to the gorgeous Pacific coast. Guests were treated to music by the Unabridged Big Band, to a stunning rendition of the Star Spangled Banner by Shauna Steiner Torok, recognition of all the military services, an apple pie contest (the top two finishers were men! ), a patriotic bike parade, a puppet show and face painting and awards for children essayists, Americanism (De De Hicks), volunteerism (Josh Liu) and the Norris Heritage of Freedom Award to noted historian and keynote speaker Kevin Starr. Kevin Starr (CA Librarian Emeritus) is the author of a multi-volume series on the history of California, collectively called “America and the California Dream.” The most recent edition is The Coast of Dreams (2004), a concise cultural history of California since 1990. In 2006 Starr was awarded a National Humanities Medal. Starr opened with a reminiscence of his time at the White House when he received the Humanities Medal from President Bush. He contrasted the classical Greek architecture of the White House with the Mediteranian architecture of Malaga Cove in PVE. Yet, for all the thousands of miles between us, we are all one country, “from sea to shining sea.” He talked at length and with wonderful detail about the Westward movement and the incorporation of California into the Union. He asked the founding fathers and mothers to join us in this day of celebration. It reminded me of what is sadly slipping away in much of America: a deep and abiding sense of the cultural history of our great nation. Dennis Prager calls for a July Fourth seder. “Perhaps the major reason Jews have been able to keep their national identity alive for 3,000 years, the last 2,000 of which were nearly all spent dispersed among other nations, is ritual. National memory dies without national ritual. And without a national memory, a nation dies. That is the secret at the heart of the Jewish people's survival that the American people must learn if they are to survive. As parents and grandparents we need to see to it that the history and values of our great country are taught and are cherished by our kids and grandkids. I saw an example of that in Malaga Cove today. As the great social theorist Alexis de Tocqueville commented long ago in Democracy in America, “the village or township is the only association which is so perfectly natural that, wherever a number of men are collected, it seems to constitute itself.” That perfectly natural township is alive and well on the Palos Verdes Peninsula. When news broke of the attempted car bombings in London and the SUV explosion in Glasgow airport, the British media immediately posited the question of the new Prime Minister’s resoluteness. 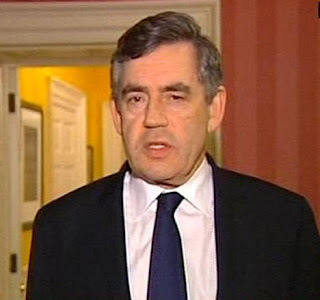 The somber Gordon Brown appeared briefly on national television from 10 Downing Street late Saturday. “I want all British people to be vigilant and I want them to support the police and all the authorities in the difficult decisions that they have to make,” he said. “I know that the British people will stand together, united, resolute and strong.” Clearly the terrorists were testing the new Prime Minister and trying to influence his policies. Will they be successful? An ABC news report on June 18 described large teams of newly trained suicide bombers who are being sent to the United States and Europe, according to evidence contained on a new videotape. Teams assigned to carry out attacks in Great Britain, the United States, Canada and Germany were introduced at an al Qaeda/Taliban training camp graduation ceremony held June 9. Brown’s intellectual appetites are more catholic than his political image implies. “He has really moved away from a social democratic position on the economy. He is pretty much a market liberal,” says another adviser. He is a fan of globalization, his favorite book being Why Globalization Works by Martin Wolf. He reads big books like Henry Kissinger's Diplomacy, Timothy Garton Ash's Free World and Samuel Huntington's The Clash of Civilisations. Brown has an appreciation for the threats facing Western Civilization. Brown has recently been giving speeches and writing articles on Britishness. He adheres to the view of Linda Colley (Britons) that Britain is “an invented nation, united by a broadly Protestant culture.” It sounds a lot like Seymour Martin Lipsett’s American Exceptionalism. (“He's fascinated by the US's ability to ground itself in writing and image, in a way we can't.”) Brown’s British Council lecture Britishness (July, 2004) roused a patriotism which in the British was real, deep and popular. Thus far, I see Gordon Brown as a worthy successor of Tony Blair, perhaps even more American than the long time Labour leader. Thus far, I like the cut of his jib.